3. 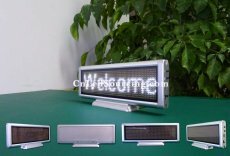 Display color is optional in red, green, blue, yellow or white and the size can be customized. 10. Built in high performance polymeride lithium battery which can work for around 8 hours long with 2 hour recharging.